Best of the Week: Munich High End Show, Audiolab's first headphones, Sony 4K projector and more | What Hi-Fi? This week, at the Munich High End Show, Chord unveiled its Hugo TT 2 DAC. Audiolab, in partnership with in-ear monitor manufacturers ACS, announced its first ever headphones and Astell & Kern launched two new hi-res personal music players in the A&norma SR15 and A&future SE100. Not typos, product names. The world's gone mad. 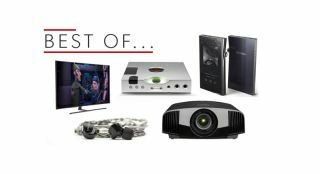 For reviews we have Schitt Audio's Magni 3 headphone amp, Sony's VPL-VW260ES 4K projector and Samsung's QE55Q9FN 4K TV. Chord has announced the Hugo TT 2 DAC, replacing the original and slotting in between the Hugo 2 and flagship DAVE DACs. It's the recipient of a number of upgrades, including a new chip that offers five times the processing power of the original. More connections have been added and there's a newly designed power supply that aims to improve noise-shaping. It's out in the autumn for a price of £3,996. Astell & Kern has unveiled two new high-res portable music players in the A&norma SR15 and A&futura SE100. The former supports DSD64 and 24bit/192kHz PCM files, while the latter supports sample rates of 32bit/384kHz and DSD256. Both are expected soon, with the A&norma priced at $699 and the A&future at $1,699. Audiolab has teamed up with ACS to bring two pairs of headphones to the high-end market. The M-EAR 2D and M-EAR 4D are in-ear efforts, the first headphones Audiolab has produced and feature ACS technology in the form of SSI (sound stage imaging), which aims to widen the soundstage. Both models will be available in June for £300 and £600 respectively. "A strong argument for true-not-faux 4K"
You won't find a native 4K projector that costs anything less than a pretty penny. Sony, however, aims to bring the barrier down with its latest effort. It produces a refined colour palette, serving up a good balance between richness and accuracy. It's also very capable performer in unearthing detail and textures. The price may be a sticking point, but true 4K projectors aren't cheap. Sony's VPL-VW260ES makes a strong case for dishing out the cash. "Schiit by name, really rather good by nature"
Schitt Audio is a funny name for a hi-fi company, but its Magni 3 headphone amp is no joke. It's a simple effort, basic in looks and features. It does what it says and not much more, but, it's a very easy listen with a smooth and well-balanced sound. It does this without breaking the bank, making for an enjoyable slice of desktop hi-fi. "For some people, be an even better option than the OLED equivalent"
Samsung's investment in QLED continues with the QE55Q9FN and it could arguably best OLED TVs. It offers a bright and vibrant picture, with deep and detailed blacks. There's plenty of apps and features and the OneConnect box is an elegant solution to power management and connections. It's a big step forward for QLED, standing as a very compelling alternative to LG's and Sony's OLEDs.